Searching for work when you first land in Japan can seem like a daunting task, but if you are focused, patient and organized, you shouldn’t have to wait too long before finding an English teaching job that is suitable for you. The first step to finding an English teaching job in Japan is to make your resume available to a large pool of employers; there is no point in having the perfect resume if no one can see it. The GaijinPot Job System is the largest source of jobs in Japan and uploading your resume will put it in front of hundreds of potential employers. When thinking about what kind of job you want to apply for, it’s a good idea to focus on jobs that fit your criteria and give you the best chance of being hired. These two categories will help when trying to narrow down your search. What do you need from this job? Pay: If you are living in a bustling city, rent, transportation, taxes and living costs will be greater than if you are living in the countryside. Work out what your monthly budget will be and the minimum wage you require to live comfortably. Location: Relocation costs are extremely expensive in Japan, with cleaning fees, deposits, key money, payments to guarantor companies and transportation costs, moving may not be a viable option unless you have money saved up. Therefore look for jobs within easy commuting distance; some positions will actually require you to live within so many miles of the school, due to extreme weather conditions potentially disrupting commuting times during term time. Students: If you have no business background then a corporate teaching job may not be the best for you, no matter how good the pay is. Teaching English to children is also a popular option but make sure you love kids otherwise you could be in for a long and miserable day. Clearly defining who you want to teach help you connect with the students and be a productive employee. What does the employer expect from you? Some teaching positions require specific teaching qualifications and/or experience. They may also require that you have a certain grasp of the Japanese language, as office duties are often required for some positions. Being honest from the outset is highly advised, you will want to avoid the later embarrassment when they find out that your language ability is limited. Visa: Do you have the relevant visa? Some positions are able to sponsor a visa for you, but unless they say otherwise, assume they can’t. If you are trying to work in a public school, having an “Instructor’s” visa is preferable, whilst jobs at English conversation schools normally accept the “Humanities” visa as well. Hours: Working hours are often the most difficult aspect to compromise on, nobody really wants to work on the weekend, but for some positions, it is unavoidable; again, most employers will let you know from the outset what they expect from you, if it isn’t a schedule you are comfortable with, don’t apply. 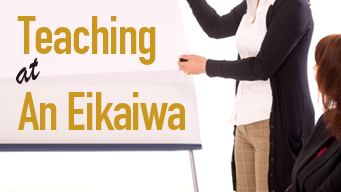 Now that you have your checklist complete, you should think about what kind of job you can apply for, Gaijinpot has an extensive explanation of what kind of teaching jobs you can find in Japan, but below is a quick explanation of some of the common English teaching jobs. This will normally see you working through a dispatch company to find a place in a public school (most commonly Elementary or Junior High). You will normally work for 8 hours a day and be given (on average) 8 weeks holiday per year. Monthly wages can range from ¥200,000yen to ¥260,000. As there is a team of office workers ensuring you do well at school, this is a great job for those new to living in Japan. Read more about working as an ALT in Japan. Working as a preschool or kindergarten teacher will usually require certain qualifications or specific experience teaching children. Your work hours will be typically 8 to 9 hours a day, 5 days a week (which may include Saturday), and you can expect 4 weeks holiday a year. It’s a busy schedule and the expectation that you will bond with both your students and perhaps their parents as well. Read more about working as a kindergarten teacher. Conversation school positions are normally paid by the hour, so the more you teach the more you earn. Your schedule will be dependent on what classes are available, so expect it to change on a weekly basis and working evenings and weekends is also very common. Students tend to be much more responsive at English Conversation Schools as they have chosen to pay to attend and therefore will be more enthusiastic about learning English. Read more about working at a English conversation school. Again paid by the hour, these classes normally take place during regular working hours, although you may sometimes be asked to teach after the employees have finished work. The pay is normally a little higher than English conversation schools, but the hours are more sporadic. The English level is usually higher with corporate lessons so it can be a welcome change from the monotony of working at an eikaiwa. By focussing on where you submit your application you increase your chances of being hired. Use the GaijinPot search parameters to focus your search by location, industry, language proficiency, etc and be sure to check the website often as new jobs are always being added. Get a job in Japan by uploading your resume to the GaijinPot Job System. If you enjoy variety of teaching options in your job, then working at an English Conversation School is a good option. 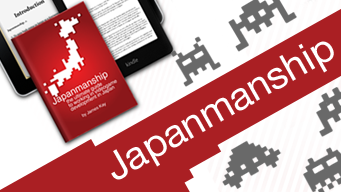 Japanmanship is your ultimate guide to getting a job in video game development in Japan.